An insulated wall may have a rated R value of R-13, but a typical sliding glass door or window may only have an R value of R-2! Obviously, the door or window is a big energy loser. Your home's exterior doors can be contributing to your discomfort and high energy bills; especially if the doors are old, uninsulated, inadequately air sealed, and/or improperly installed. If your entry doors or patio doors are old, replacing them with better-fitting models can result in lower heating and cooling costs and a more comfortable home. The experts at Complete Home Solutions can help you select the best replacement doors for your needs. We offer a variety of energy-efficient exterior door options from leading manufacturers that will provide the style and long-lasting durability you're looking for. Call us at 1-855-247-9984 or click below to request your in-home consultation. We provide free door replacement estimates in Annapolis, Glen Burnie, Pasadena and surrounding Maryland areas. Steel and fiberglass doors typically provide better insulating than wood doors. Models that are ENERGY STAR®-qualified are independently tested and certified to ensure greater efficiency. ENERGY STAR®-compliant doors typically have tighter-fitting frames, energy-efficient cores, and glass doors come with double or triple-panel insulating glass to reduce heat transfer. 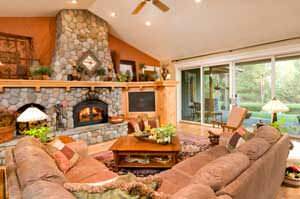 Glass patio doors and sliding glass doors lose much more heat than other types of doors because glass is a poor insulator. Doors with multiple layers of glass, low-emissivity coatings, and/or low-conductivity gases between the glass panes provide greater energy efficiency. When replacing your patio door, a swinging glass door can provide a tighter seal than a sliding door. Heat is generally lost through air leaks around the door, not through the door itself. During installation, we make sure the doorframe is as square as possible, so that the door seals tightly to the jamb and swings properly. We also apply caulking to seal the door frame to help prevent air from getting around the door seals and into your house. When you choose Complete Home Solutions for new door installation, your entry door, sliding door or any other type of door will be installed by a trained technician. When the job is done, our team will clean up the installation site and remove any job-related debris. As a home performance contractor, we not only install energy-efficient doors and windows, we can also diagnose your energy problems to make your entire home more comfortable and energy efficient. Get a free estimate for your door upgrade today! Contact Complete Home Solutions to schedule a home energy evaluation and request a free estimate for your door replacement project in Rockville, Annapolis, Bowie, Bethesda, Upper Marlboro, Waldorf, Laurel or surrounding areas.